The story of AC4 was fantastic. I will say that it can be confusing if you aren’t paying close attention, and it can be overwhelming if you choose to read into all the text thrown at you. I’ll be the first to admit I skipped most of the extra stuff, focusing instead on missions and cut scene-based story telling. If you get lost, just read the wikipedia entry and you’ll be fine. I’ll do my best to give you a quick summary without spoilers. You’re Edward Kenway, a pirate. You get mixed up in a plot driven by the Templars trying to seize power over world leaders by assuming the identity of a would-be defecting assassin. Throughout the game you will play for both sides all the while unraveling the big mystery of the game and trying to live the glorious life of a pirate. All isn’t what it appears to be, nor will it ever be, in this fantastic adventure. I get goosebumps just thinking about it. 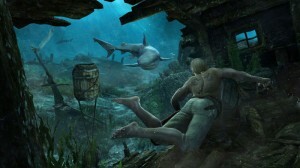 Much of the game takes place on foot like you may have experienced in previous Assassin’s Creed games, but a huge portion takes place on the ocean. I can easily spend hours sailing around the open waters of the Caribbean attacking English, Spanish, and French vessels ranging from small schooners to massive Man-o-Wars. Sinking vessels is gratifying, but damaging them enough to grapple and board them gets the blood pumping! Controlling a huge ship is like a dream come true for me. The controls are basic, but slowing down and speeding up, aiming cannons, sailing through storms, attacking forts, drifting through swamps, and seeing all the ways a ship can be used in AC4 is easily the best ship usage I’ve ever had in a game. When sailing around isn’t enough, diving to find treasure and upgrades provides yet another unique experience on the ocean. The world is AC4 is overwhelming. Every time Graev watches me play he says, “This game is just too big… way too big.” He is also referring to the enormous number of collectibles you can go after. When sailing out in the ocean, occasionally you’ll come across a tiny little island. Exploring anywhere simply requires you to slow your ship and dive off into the water and swim to shore. You’ll find animals to hunt, treasure to loot, treasure maps, and mysteries Mayan artifacts. The number of upgrades and opportunities to customize your ship and person are yet another way AC4 provides hours and hours of depth. Once you’ve had your fill of the ocean, set sail for one of the dozens of ports like Havana, Nassau, or Tortuga where you’ll find hundreds of collectibles and all sorts of side missions. Take on the usual assassination contracts or help the Templars, the choice is yours. These side missions can be the source of much confusion. I didn’t quite understand why I could walk up to a pigeon coop and take a contract in the very first city of the game. Turns out, it all makes sense as you progress the story. I recommend waiting on all these side missions until you’re very, very far into the game (15+ hours for me). The environments here make for tons of unique adventures. Some of the cities are fully developed with forts and tons of buildings, but others are little sea towns with shacks or cities built in old Mayan ruins. The variety is excellent, and the scenery wherever you go is detailed and gorgeous. I never tired of the land gameplay, and found it every bit as fulfilling as the ocean. Whether you want to sink ships all day, assassinate an oppressive governor, or unravel the mysteries of a secret order, Assassin’s Creed 4 has enough swashbuckling and explosive action to keep you on the edge of your seat for at least 25+ hours. A somewhat confusing narrative and a few glitches here and there keep it from being an absolutely perfect game, but I have to give it a 10/10 for being so dang close. If you haven’t picked it up, you’re missing out on what I feel was the best game of 2013. I just finished Black Flag this past weekend with 95% synch and I think I would agree fully with your entire article. It has been a very long time since a game/world has sucked me in and engrossed me so completely. While it did indeed have some minor flaws, I think it best represented everything a video game should be this past year! “Everything a video game should be” should let you play as either a male or female character. The game can’t be a 10/10 if “You’re Edward Kenway”. @Jackie: There are some great female protagonists in the game like Mary Read and Anne Bonny — quite prominent throughout the story. They make for some very fun dialog. These famous pirates were the only known women to be convicted of piracy from this era. There is also a fair bit of additional content you can play as the female assassin known as Aveline de Grandpré. I understand your point of view, but keep in mind this historical fiction game takes place in an era where it makes more sense to play a male — even the women pretended to be men. I have only played about 10% of the single player since I get got caught up with Mulitplayer every time. Always got turned off AC games due to the great setting but the absolutely shite writing. Its like turning on brave-hart and getting a Saturday morning cartoon instead. I enjoyed the first AC game, but never played the second, and then after that it just got crazy with spin-offs that just turned me away from the series. That and I remember hearing a lot of people were disappointed by AC3. 4 looks like fun though, and I do love me some pirates, but I feel like I’d need to sit down and go through the other games first. I actually just re-installed the first game the other day and was planning on giving it a whirl again and this time try to finish it. I got gifted a hard copy of Revelations, but because I had to use Ubi-softs client to install it, when they screwed me out of the game (product key in use, after I had already been playing it for a few days) I gave up on their games. I just picked up ac2, brotherhood, and revelations for 75% off in the steam deal. Going to have a great time! I just bought a new video card which came with a free copy of this game, very excited to play it. I’ve never played any games in this series, and I have absolutely zero interest in the overall plot of Assassin’s vs Templars and time travel or whatever it is. I just want that open ocean. bleh, the steam copy still launches the stupid ubisoft client. and what do you know, after playing 13 hours overnight (re-adjusting my bodyclock for a nightshift at work) i reloaded it after my shift to find myself back in havana losing a good 10 hours of gametime. I’m baffled by why it keeps resetting your progress. Who knows, am taking backups of my saves ever half hour or so. Is anouther company I will be extreamly hesitent to buy from.